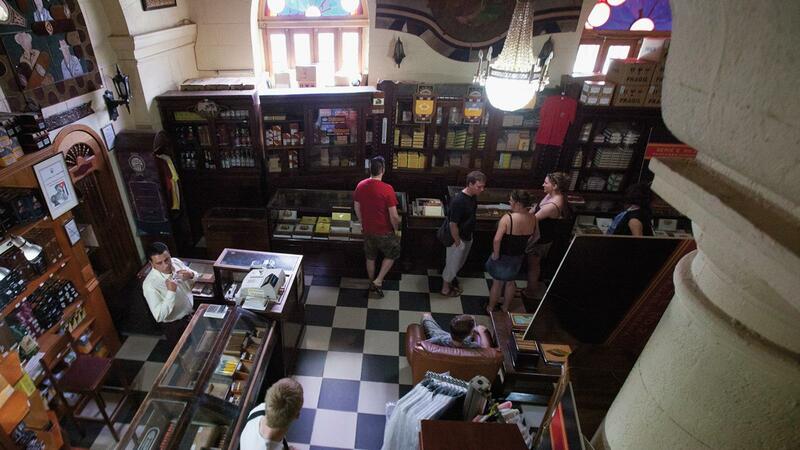 The Partagás Cigar Factory store, one of the busiest in all of Havana. Cigar shopping in Havana is an aficionado's biggest fantasy. There are always visions dancing in their heads of shelves filled with the forbidden fruit of Cuban cigars, and no problem finding what you want to smoke. The reality is not quite so fantastic. Cigar Aficionado has been in Havana when supplies were low. And, we have been there when shelves were full, but retailers warned that a month earlier they had been without most major brands. What that means is your shopping experience may depend on any number of factors—from low inventories due to a huge tour group of Hong Kong collectors having been there the day before to a simple cycle in when the cigar shops are supplied. In any case, you should be ready to buy things that might not have been at the top of your list. And, frankly, as executive editor David Savona has pointed out many times, some of the best deals are found in lesser known brands in unpopular sizes, or as I have found, on the bottom shelves of every shop. But we are like any cigar lover visiting Cuba. We always visit cigar shops, and take a look at what they are offering, knowing that a month later things may be totally different. Therefore, you can take this snapshot as the way things were from November 16 to November 21, which coincided with the Friends of Partagás festival in Havana. Habanos S.A., the Cuban cigar marketing giant, likes to make sure that the cigar loving visitors for the party have plenty of stock to choose from, so the inventories were quite good. I visited four of our favorite Casas del Habano in Havana during that trip: Hotel Habana Libre, Meliá Habana, Hotel Nacional, 5th Avenida y 16. There are many other shops—some with more character, some smaller, and some not quite so central, but these four usually have the best and most extensive selection. What was striking was the almost total absence of Cohiba Behikes. I found three open boxes selling single sticks in the Habana Libre, with prices ranging from $25 for the BHK52 to $36 for the BHK56 (converted from Cuban CUCs). Elsewhere, store managers said they had not seen any Behikes in at least two months, and some said it had been up to four months. I came across Hoyo de Monterrey Double Coronas at only one shop (5th Avenida y 16), a cabinet of 50 and eight boxes of 25, which may be a reflection of the tobacco shortages in the manufacturing pipeline, especially for big wrapper leafs. There were a number of boxes of Punch Double Coronas, Ramon Allones Gigantes and Partagás Lusitanias, although many of them had box dates from 2013 and 2014, reflecting the fact that they had probably been on the shelves for a longer time. The majority of the box codes, which are stamped onto the box after the cigars have been packed, were from early 2015 and as late as October 2015. I found very few older boxes on the shelves. One box, a Romeo y Julieta Cedros Deluxe No. 2, carried a December 2009 box date, but it was a one-off. The most impressive inventories were the two new Añejados, the Montecristo Churchill and the Romeo y Julieta Pirámide, which were shown at the 2015 Festival de Habanos. All these cigars carry box codes that should date back at least five to eight years, and the majority of the boxes I checked were from 2008. In these four shops I mentioned, there were at least 20 to 30 boxes of each brand. The prices (converted from CUCs) were uniform, as they are for all cigars: Montecristo Churchill, $378 for a box of 25, and the Romeo y Julieta Pirámides, $318 for a box of 25. Apart from the Behikes, there was also a shortage of any of the 2015 Edición Limitadas, Regional Editions (the new Cuba Exclusivo Diplomáticos Excelencia was sold out), Reservas and Gran Reservas. The Habana Libre shop did have one open box of Ramon Allones Club Allones, a 2015 Edición Limitada. They were $9.40 each.